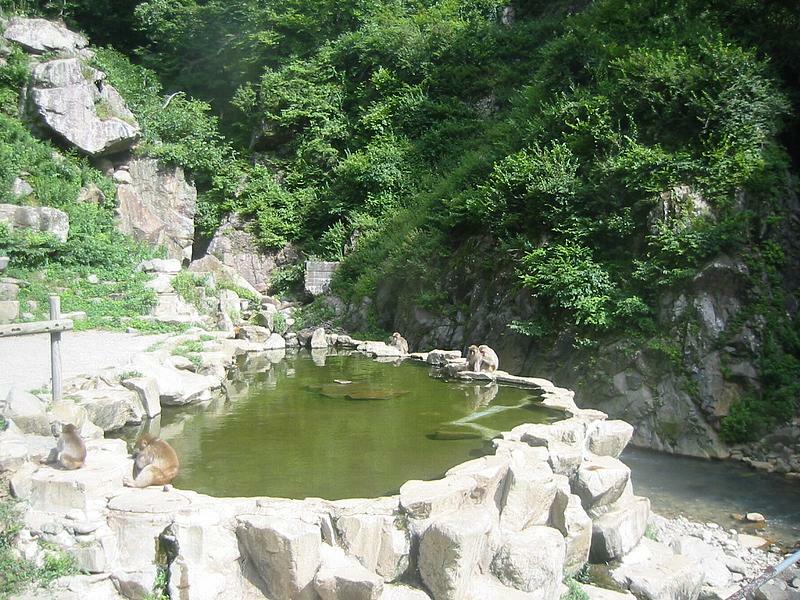 Most people have seen the snow monkeys on TV bathing in the hot springs at Jigokudani about 1& 1/2 hours from Hakuba. If you want to see the real thing it is very easy to do so on a day tour from Hakuba. You do need to allocate a full day though and to give up a day on the mountain. This will set you back at current rates ¥12,000 a person (¥8,000 for children). The tour usually includes transport, the park entry fee, lunch at a restaurant, a trip to the historical town of Obuse and a trip to the 1,400 yr old buddhist Zenkoji Temple. To get to the monkeys is a 30-45 minute walk along a forest trail (take sturdy shoes and warm clothing). If you are renting ski or snowboard gear we recommend you schedule your snow monkey tour for the last full day of your trip in Hakuba so you are not paying for a day of rentals that you won’t use. The tours typically leave around 8am and get back at 5pm. The following are 2 companies that run the snow monkey tour and that can be recommended. Runs daily tours from the middle of Dec till the end of Feb, and 4 days a week during March (Mon,Wed,Fri,Sat). Do tours 4 days/week (Mon,Tue,Thur,Fri) from the middle of December till the middle of March. Another option is to do it yourself with public transport. Entry fee to the park is only ¥500 but it will cost a lot more for the transport. • Option 1. Bus from Happo Bus Terminal then bus to the park. o 8 departures a day o Bus from Happo Bus Terminal to Nagano for ¥1,900 each way. o Bus from Nagano to the park ¥1,400 each way (8 departures a day. • Option 2. Direct Alpico bus from Happo Bus Temrinal to the park o 2 departures a day leaving at 8.45 and 9.45 am. o Return 13.00 or 14.30 pm o Takes 2 hrs. o Costs ¥3,900/adult or ¥1,950 child (6-11 yrs) o Children 5 yrs or less free if no seat required. o Does not run Dec 29-Jan 3. Most people have seen the snow monkeys on TV bathing in the hot springs at Jigokudani about 1& 1/2 hours from Hakuba. If you want to see the real thing it is very easy to do so on a day tour from Hakuba. You do need to allocate a full day though and to give up a day on the mountain. This will set you back at current rates ¥12,000 a person (¥8,000 for children). The tour usually includes transport, the park entry fee, lunch at a restaurant, a trip to the historical town of Obuse and a trip to the 1,400 yr old buddhist Zenkoji Temple. To get to the monkeys is a 30-45 minute walk along a forest trail (take sturdy shoes and warm clothing). The tours typically leave around 8am and get back at 5pm. The following are 2 companies that run the snow monkey tour and that can be recommended.